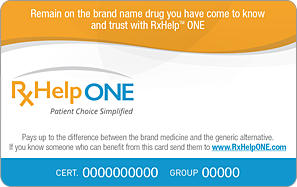 The RxHelp ONE card helps patients remain on the brand name drugs they have come to know and trust. ONE Card – Access to dozens of brand medicines from multiple manufacturers at little or no cost versus the generic alternative. Featuring ONE Certificate Technology – ONE Number used for all patients. Go to www.RxHelpONE.com today to learn more. Over three dozen brands currently covered. Click Here to see current brands covered.